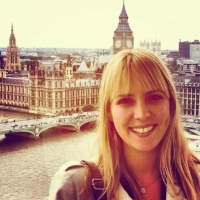 Brooke Bonkoski is a civil engineer working in water remediation living out on the West Coast in Oregon. Her interest was sparked in college, where she began as a mechanical engineer wanting to design skiis. However, she took a civil/environmental engineering class and then knew that was what she wanted to pursue. 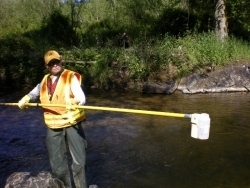 The lack of an environmental engineering major caused her to become a civil engineering major, but the work she does now is primarily related to environmental work. Brooke explained that her company works for clients who hire them to solve their problems, so it isn't quite as dry as some other kinds of engineering work out there. She went on to further explain the process by which her company works for their clients. "You have some chemical that has spilled which poses a risk to humans or the environment (animals, fish, aquatic life). Our goal is to reduce that risk so that it is not posing a threat to the environment or humans. Reducing the risk can be done in lots of ways. You can excavate or remove the material which is called dredging. You can stabilize it by making it bound in place. Or you can isolate it by covering it over with something that is impenetrable so you can no longer come into contact with it. Sometimes you can even treat the material. For example, burning the soil at a high temperature rids it of chemicals but then you have burnt soil to deal with." When asked what her favorite part of her job was, Brooke said it was the fact that it is different every single day, which is something very important to her. Though there is a general expectation of how the day will go, it can change as things come up. There are new challenges with each site even though there might be an established way of doing things, so there is something new with each one. Working in water remediation is the same general concept but each site is unique and brings its own challenges that must be faced and adapted to. Engineering is a field in which women are traditionally underrepresented. Brooke mentioned that early on this factor was part of what drew her interest in the field. As a mother of two young children, she shared some of her insights on women in the workforce. "People want to change it, the fact that women are underrepresented, but a lot of it is unconscious," she said. "Supporting women when they leave to have kids and ensuring they can reenter the workforce would be a big help." She chose to return after her six months of maternity leave with her first child, and she credited a supportive husband and progressive work environment with her ability to do so. Some women really enjoy their maternity leave and realize they want to stay at home but some realize just how important their career is. Either choice is perfectly acceptable, Brooke explained. "It has to be what you recognize is best for you." Working in a field that is usually male dominated, Brooke's story and her passion for her work are inspiring. Her knowledge of the work she does is impressive and admirable. When I walked into Damascus Road Community Church one Sunday morning, I was greeted with a few of my fellow members dressed in first century garb with a basket full of stones. They said, "You have to get stoned at church today," and we all picked a rock to bring into the sanctuary. With all the news about Colorado, legalization and everything, I kiddingly thought, "Oh wow. I know we are fairly progressive as a church, but this is interesting!" The message was part of a series about encounters with Jesus, and this particular one was the adulteress caught and being accused and sentenced to be stoned to death. As some of you may know, Jesus basically said he who casts the last stone is free from sin, and of course none of us are free from mistakes and holding grudges and hurts. The bottom line, or Monday morning application, was for us all to think about the stones we are holding, the judgments we are keeping, the stories that we continue to replay that makes us angry, lonely and hurt. They keep us holding on to that stone so we can cast it upon another to release our anger, to get back at those hurts, to perpetuate how we were wronged in the past. Instead – Drop the Rock. Let go of the past, release that negative space and free up your energy for something more important. Loving our neighbor, helping the poor, setting goals, motivating others, finding our passion, using our talents for good. This rock theme intrigues me and found rocks symbolizing setting goals and time management. I found this great You Tube video demonstrating the pickle jar theory of big rock time management that you may want to look at. It resonates with me! How can I apply "Drop the Rock" to my clients. That is a theme in many of my coaching conversations. A negative experience, or story, that is keeping my client from reaching their potential, seeing other options, seeing more choices of how they show up and make meaning in the world. I started thinking about what can we do with our rocks that would be for good, and a cairn came to mind. 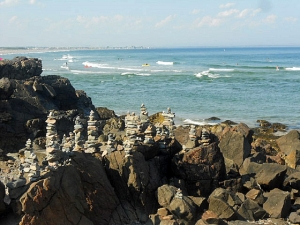 Last summer, as I walked the Marginal Way in Ogunquit, ME for the 100th time, I noticed for the elaborate cairns adorning the rocky coast. The Scottish say "kayrne." And roll the 'r' in on the way they can. Kern is also acceptable. This definition helped me to discern what I'd like to do with the rocks I symbolically carry. Wiki states (so it must be true), that "a cairn is a man-made pile (or stack) of stones. The word cairn comes from the Scottish Gaelic: càrn (plural càirn). Cairns are found all over the world in uplands, on moorland, on mountaintops, near waterways and on sea cliffs, and also in barren desert and tundra areas. They vary in size from small stone markers to entire artificial hills, and in complexity from loose, conical rock piles to delicately balanced sculptures and elaborate feats of megalithic engineering. Cairns may be painted or otherwise decorated, whether for increased visibility or for religious reasons. In modern times, cairns are often erected as landmarks, a use they have had since ancient times. Since prehistory, they have also been built as sepulchral monuments, or used for defensive, hunting, ceremonial, astronomical and other purposes." Such cairns adorn places along the Appalachian Trail and Acadia National Park as examples, and when used for their intended purpose, are useful and beautiful. In my research, I learned of a controversial phenomenon called "epidemic cairns." Structures are randomly constructed as artwork, and many perceive them as graffiti. They confuse the hiker/biker, and compromise the natural landscape. Local residents are upset, and are educating others about "Leave No Trace." LNT is a code of ethics to keep the landscape the way you find it. Learn more here. With that said, I want to redefine my rocks and memorialize a landmark, a step through my own history. A metaphoric milestone, to notice, honor, capture and move through it. A cairn, of sorts, that is meant for the traveler, to assist in guiding their path. 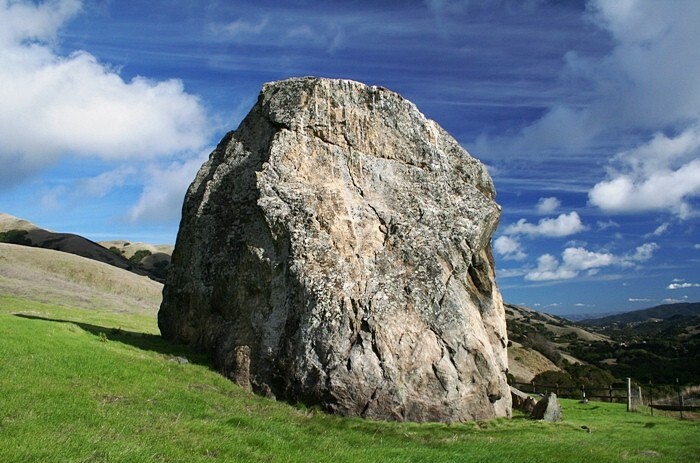 Drop the Rock: what's the rock you are carrying, and how is it serving you? 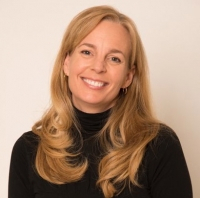 Sheila Berry, a business systems analyst at Booz Allen Hamilton, is the founder and executive director of a new business in the Washington, DC Metro area with a very unique goal. Living Vicky seeks to extend bridges across generational gaps in the workforce and "empower young women with the keys to the world. "Vicky" is an acronym for "vision, integrity, caring, knowledge, and youthful energy." It demonstrates Living Vicky's overall goal of overcoming negativity with positivity. Through monthly workshops available to any company or organization with multiple generations embedded in their staff, personal online and face to face mentoring for young women transitioning from high school to "whatever comes next," and a new program entitled "Traveler Pilot" which targets 18-20 year old women preparing to enter to the workforce, they aim to help change the negative stereotypes different generations may have of each other, particularly employers toward Millennials. Ms. Berry points to research that has been done as the launching pad for her idea. Many older businessmen and women have a negative impression of Millennials entering the workforce, believing that there is a significant gap between Millennials and other generations. The advent of technology, she says, creates a larger perceived gap. However, there are commonalities between, say, twenty year olds, from all different generations. Ms. Berry's goal is to facilitate the building of bridges to cover these perceived gaps. The idea for mentoring has been percolating with Ms. Berry throughout her entire life, because of the wonderful mentoring that she herself cites as a fundamental building block to her professional growth. Working in the hospitality industry as one of her first full-time jobs, she shares that her youth and natural tendency to always to things exactly by the book led to friction with co-workers. Her first mentor came to her as the situation came to a head and said, "Sheila, do you want to be right, or do you want to get the job done?" Naturally, Ms. Berry's response was "I want to get the job done by being right!" Through the mentorship she received in this difficult time, she experienced personal and professional growth, giving her a desire to provide this for other young women. Ms. Berry has many nieces and nephews for whom she performs the role of mentor as well. She chooses not to give them gifts on birthdays or Christmas but rather saves money for each, and at the age of 13 she flies them to DC to visit her where she lays down the "rule of five" which include: no pregnancies given or received, no drugs or alcohol, and no tattoos. If the rule of five is kept, you can pick a trip anywhere in the US for yourself and a friend. If you complete your higher education, you can choose a trip anywhere internationally. Her niece Katie plans to go to New Zealand. Jordan, who has always loved penguins, plans to take his international trip to Antarctica though he has years to wait. The trips act as a guiding North Star. Ms. Berry's question then became, "how can I share that with other young women?" Ms. Berry is very clear about one thing: Living Vicky is a collaborative entity. The curriculum is designed by those with the best skills for that particular job, the workshops are administered by those with the appropriate skills for that job, and so on. Living Vicky is not a pyramid with the Executive Director at the top; rather, it is Olympic circles. 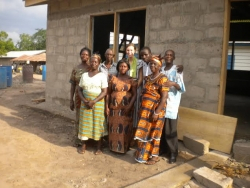 The company itself, a non-profit, seeks to live by the goals it shares with others. Faced with the challenge of balancing a full-time job with Booz Allen Hamilton and running a non-profit, Ms. Berry explains it isn't really a balancing act: it is an integration act. Whatever needs more attention receives it. Integration and collaboration are key to Living Vicky. Ms. Berry's idea has come to a fruition that has received extremely positive reviews in the business community where Living Vicky has been welcomed with open arms.